Above: Mary O’Brien, second from left, with friends and co-workers. Mary O’Brien retired from her position as house manager at the Ringsend and Irishtown Community Centre creche last November at 66 years of age. Mary has spent 37 years working at the community centre creche. 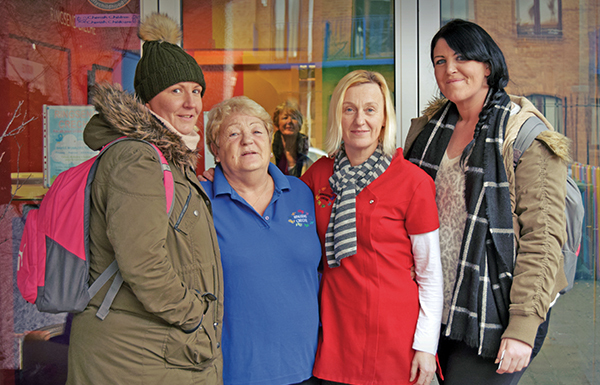 It all started out in prefabricated huts in Canon Mooney Gardens but now the creche has a wonderful playschool with a fun atmosphere on Thorncastle Street and boasts 25 staff. Mary was born in Irishtown at St. Brendan’s Cottages and is 46 years married to Jimmy. Her three children, James, Georgina and Aoife attended the creche she managed for so many years. Not only has Mary contributed her hard work to the creche, she also had a place on the management committee for the community centre and worked on the summer projects, which brought children from the area out on fun trips. Even though Mary is officially retired she still pops in for a few hours every week. “I love it. I like to be here for all the girls, to support them. And any parents that need help, we support them too.” The motto of the creche is high quality, low cost and it has been at the centre of the community as a non-profit organisation. The parents’ association of the creche came together to create a presentation night for Mary in November, where they gifted her with a This Is Your Life style book, filled with the history of her work and fundraising efforts with the organisation. Despite all this recognition, Mary remains humble. “What you see is what you get with me. I would be the same with the Pope.’’ She wants to thank her co-workers, manager Marian Allen and assistant manager Caroline Maher, the local community and Tesco’s Sandymount community fund for all the support over the years. In fact, alumni of the creche have a recent claim to fame. Nicole Meers and Toni Mockler came third at the recent 2017 BT Young Scientist and Technology exhibition with their app for men’s mental health, Maybe they can thank Mary for their great start in school life!